Black and Gold Unicorn Face Sequin Birthday Pants Outfit Ages 1-6 Long Sleeves Available! 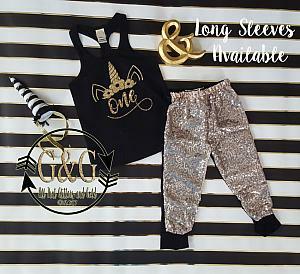 Now our popular birthday shorts outfit is available with pants! Let us add a little or a lot of shine to your little unicorns birthday with our Exclusive unicorn sequin birthday pants outfit. 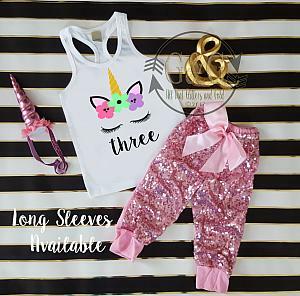 This outfit is so cute and perfect for your little unicorns birthday celebration, photo shots or every day wear. 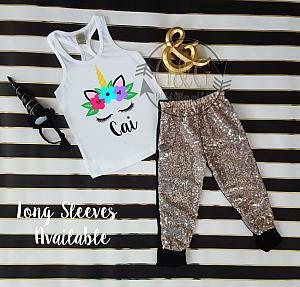 Made with glitter that wont come off and get all over the place on a cotton shirt and paired with cotton and sequin pants. The back of the pants are made with cotton and front is made with sequin. This items is handmade and takes 2.5 to 3.5 weeks to process plus shipping time. We ship via USPS to Domestic and International Addresses. If you are an international buyer, shipping will take a little longer. Processing time takes 3 to 4 weeks and delivery time takes between 14 to 21 days.